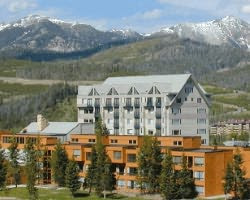 Save an additional 20% off already low Spring prices at the Huntley Lodge in Big Sky, Montana. Our friend Katie at Big Sky has put together this great deal for us, and its good for the ENTIRE month of April. Don't miss your opportunity to stay at this iconic lodge that just happens to sit right next door to some of the most amazing terrain you will ever ski!!! Conveniently located in the heart of Big Sky's Mountain Village, this three-story hotel was part of the late NBC newsbroadcaster Chet Huntley's original vision. With recent remodeling, it is as tasteful as it is convenient. The Huntley complex includes a fine dining room, lounge, coffee cart, concierge, shops, ski storage, meeting rooms and Solace Spa. Valid Dates: April 1-24, 2011. Prices based on 2, 3 or 4 guests per First Class hotel room. Call a Big Sky Ski or Ride specialist at 888-754-2167 and we'll get you all set up for some GREAT Spring skiing in Big Sky, Montana.